Rolling Thunder got up at the crack of dawn in order to try and make some real progress for the first time in what seemed like days. They all hoped that both Vera and The Mini would hold up and set their sights on the city of Altai, if they did indeed make it that far it would mark the halfway point of the voyage through Mongolia itself! 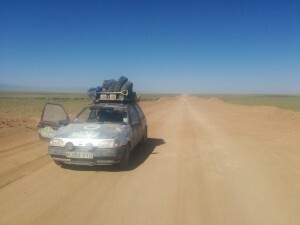 The boys knew that today would be the real test of the work that the mechanic had done in Khovd the day before and they had been told that the roads were pretty bad all the way to Altai and weren’t expecting any tarmac to help them out. Therefore the boys took the decision to fit their off road tyres that they had bought before the rally and carried all the way, they hoped they would help in the sandy conditions and there was no doubting that they looked awesome on a purple Ford Fiesta! During one of the many cool off breaks. For the morning shift Dunc and Matt were looking after Vera and Henry was driving the Mini to give Jen a rest. The convoy packed up their stallions and, to the great relief of everyone, Vera miraculously started with no jump. The convoy got onto the road quickly and soon continued their battle with both the rumble strips and the roadwork machinery. Aston Micra did go missing for a few minutes though when they stopped to help a local who’s car had broken down but were soon back up to pace thanks to Dan’s no nonsense driving. 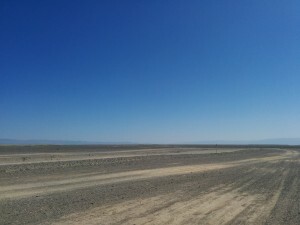 As the morning wore on Vera heated up and by lunch time the heat was almost unbearable. The windows didn’t work and the blowers couldn’t be used as they just caused a sand storm inside the car; the sun roof wasn’t much use either! 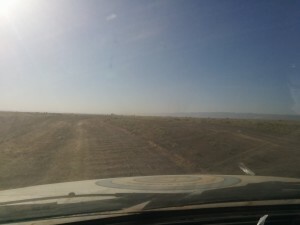 This meant that every 20 minutes or so the convoy had to stop to allow Dunc and Matt to have a cool off (not that standing in the middle of the desert wasn’t that much fun! ), during which they dare not turn Vera off. All of the tracks led to the same place, but which one to choose? All was going rather well, all things considered, until when Matt managed to stall Vera when going through a rough piece of road and she declined to start again. Unfortunately CCBB were at the back of the convoy at this point and got left behind, the others obviously weren’t checking their mirrors. Dunc and Matt had to use their best scrummaging technique in the blazing sun to get Vera out of a rut and then push her up to speed in order to bump start the old gal and she purred back into life. Crisis averted the boys were back in the chase. Rolling Thunder were making sterling progress and even managed to find some nice freshly rolled road to get some speed up on. 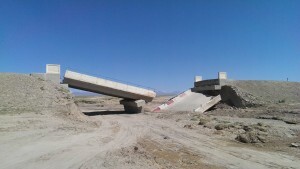 They did have to ford another river though as they came across a collapsed bridge, thankfully the river water was rather low as it was mid-summer. The rumble strips rumbled on for endless miles but the boys were making lots of progress and everyone just wanted to get to Altai so they didn’t even stop for lunch. This wasn’t going to stop CCBB! The next next problem with Vera was quite a worrying one though, after having the radiator fan on for a while due to the heat, Matt and Dunc soon smelled burning and realised that the switch they had installed a day earlier was sparking a smoking like crazy next to Matt’s leg, this was a new one even for Vera! Matt instantly turned the car off just before a probable fire and after letting the switch cool down they found that it was stuck in the on position, some components had probably welded themselves together. With the switch gone the boys just had two wired that they had to twist together when they wanted the fan on, this was quite difficult to do whilst driving! More worrying though was the ever strengthening smell of petrol fumes coming from the engine; this coupled with a spark from their cowboy electrics could have had deadly consequences! A nicely rolled section gave a brief respite to the vibrations. Thankfully the boys were nearing Altai and it was now mid afternoon so the air was starting to cool so the fan wasn’t needed as much. Also the temperature gauge was one of the only ones working so it was fairly easy to regulate the engine temperatures. As the convoy neared Altai they encountered the worst roads they had seen all day as they climbed through the rocky hills to the West of the city. 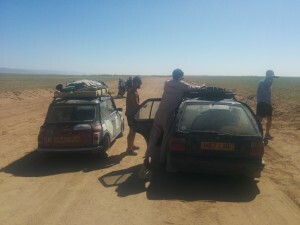 To everyone’s great surprise team Aston Micra actually came off the worst and broke their right rear suspension after some overzealous off-roading by Dan, Hillary crabbed into town. The Mini also took a couple of hard hits to its unprotected sump but miraculously survived. 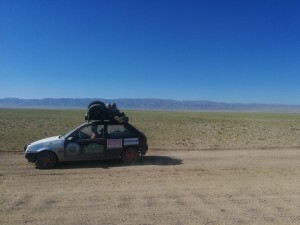 Vera, with her glorious off-road tyres was actually looking like the best car for the first time in Mongolia. The convoy made it into Altai for about 5pm but by the time they had parked it was 6pm, not that it was hard to find a space, this city had two time zones! They found a hotel that had a restaurant and, most importantly, WiFi to have some dinner at and sat down after a good days hard work. Aston Micra went off to get their suspension fixed and CCBB gave them their spare rear spring that they had carried all rally long, it was nice for the boys to give Chris and Dan something back after all their help. After the trip to the garage and a call home using the hotel WiFi, Rolling Thunder drove out of town on a nice tarmac road for about 15 miles until they found a place to camp close to the main road they would be taking the next day. They were all set up in no time and for the second night in a row actually went to sleep at a respectable time, after another successful day.